The story of Chagall is the story of a nomadic artist. Moishe Shagal was born in Vitebsk, Belarus, then part of the Russian Empire. Vitebsk was a small town, where half the population was Jewish. There he began to study art, but had to move to Moscow to pursuit a career in art, leaving his girlfriend. In the Russian capital, Jews were segregated, so he had two choices to be part of the art scene in the city: he could hide his roots or, on the contrary, celebrate and integrate them into his painting. 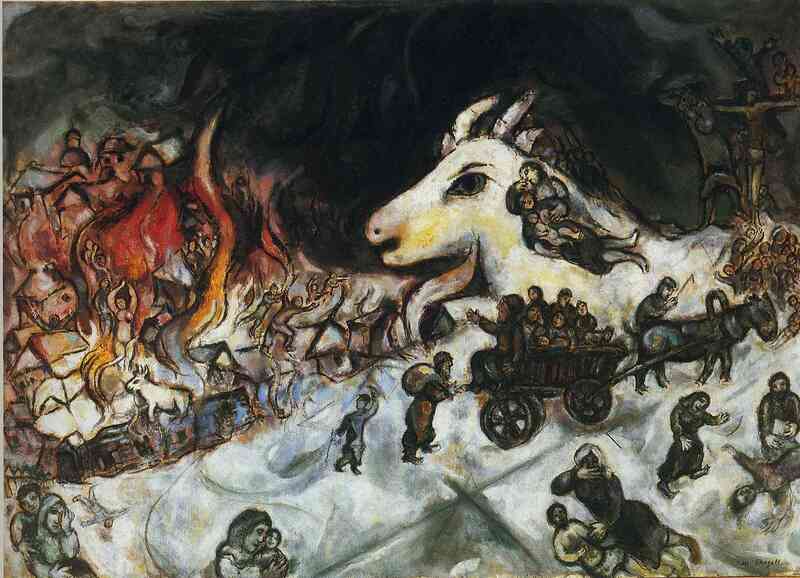 Chagall chose the second option, as a statement of principles. After some time, he moved to Paris, the city that gave birth to new art movements. However, Chagall missed his hometown and didn’t speak French, so he returned to Vitebsk, where he married the woman who had left. The Russian Revolution burst in 1917 and, although Chagall was already a known artist, his paintings continued to reflect his Jewish heritage and, therefore, were not in tune with the communist regime. Unrelated to politics, Chagall returned to France where he embraced the city better than the first time. He was able to learn the language and befriended other painters and poets. Here Moishe Shagal became known as Marc Chagall. In Paris, he was commissioned with a series of paintings of the Bible, so he decided to look for new motifs in Holy Land, Palestine (then there was no Israel as a state). He stayed there for two months and, inspired by the landscapes of the Old Testament, his painting became even more spiritual and mystical. But he had to go back to Europe to continue working. His stay in France was interrupted by World War II and, consequently, he had to migrate to America. In the U.S., Chagall was greeted with surprise. Local artists didn’t understand a thing of surrealism or the Paris School, and even less of the Belarusian’s bizarre painting. Pierre Matisse, Henri’s son, became his representative and, thanks to his influence, the artist was able become part of the local art scene. Already recognized throughout the world, in the U.S. , he paints War two decades later. In the painting we see an apocalyptic landscape. A village, which could represent Vitebsk destroyed after the Second World War, burns in flames. The characters flee, in obvious reference to the biblical Exodus. It is a scene full of despair: people burns alive in the village and the dead lie on the snow. A white animal (like a horse) carries on his back a father weeping for his wife and son. In top right, we can see a crucifix and a diabolical creature who oversees the scene, like proud of its creation. Honestly, I have trouble grasping Chagall’s paintings. I do not understand them. I find them strange, too brightly-colored and too symbolic. I prefer another kind of art. But if there’s something I have to recognize is that the work of Chagall is probably one of the most authentic if we consider the artist’s personality. He portrayed all his social, spiritual and cultural influences. As we saw earlier, the artist lived constantly moving. Like his people, he was a nomad. And like his people, he was able to maintain his identity and the commitment to his roots over time. ~ by Álvaro Mazzino on July 19, 2012. Can anyone explain the significance of Chagall’s “floating” figures seen in many of his paintings? I visited the Chagall Museum in Nice, France, two years ago. The paintings I enjoy looking at are the series on the Hebrew Bible and especially the series onf the Song of Songs (Song of Solomon). The floating figures give life to the paintings. The upside down villagescapes that often appear in Chagall’s works represent his Russian village and his feelings of despair about living in it. He often includes himself as a figure in the act of painting in his work. There are many hidden and not so overt meanings in Chagall’s paintings. When they are viewed as intended, they are strikingly beautiful. I have posted my rendition of Chagall-like painting I did when in Cannes in 2010 at http://www.theowlpress.me. Reissue 2.55 is more minimalist and understated. And most people who know and recognize it are Chanel fans and fashion enthusiasts. It’s historic being the first bag originally designed bty Coco Chanel. After 12 years as its SVP of global product, Saucony tapped O’Malley to take over the brand after former head Richie Woodworth assumed the position of president of Wolverine World Wide’s Lifestyle Group in January. This entry was posted on July 19, 2012 at 16:48 and is filed under Surrealism, Symbolism.You can follow any responses to this entry through the RSS 2.0 feed.You can leave a response, or trackback from your own site.